Dimenzije: 21,50 x 30,00 cm. Katalog proizvoda od kovanog željeza talijanskog proizvođača RIK-FER. 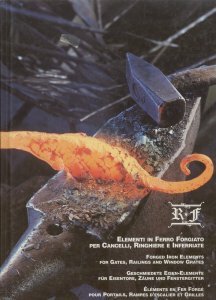 Puni naslov: Elementi in ferro forgiato per cancelli, ringhiere e inferriate / Forged Iron Elements for Gates, Railings and Window Grates / Geschmiedete Eisen-Elemente für Eisentore, Zäune und Fenstergitter / Elements en fer forge pour portails, rampes d'escalier et grilles. Tekst kataloga na talijanskom, engleskom, francuskom i talijanskom jeziku. With great pride RIK-FER presents this renewed version of its former catalog; significantly enlarged with additional to pages 220 to 316; 54 drive gates, side gates and railings are shown on pages 8 through 74, 170 banisters are shown on pages 75 through 138, and 61 gratings are shown on pages 139 through 170; all these are shown in 285 color illustrations, all are made by RIK-FER and exhibited on company premises.